From Pescara (40 Km faraway) take the Autostrada (motorway) “A25” (Pescara-Roma) and exit at “Torre de’ Passeri – Casauria” toll gate (not at “Popoli” !). Turn right and follow the provincial road (S.P. 56) just for Km 1,5 before arriving at the farmstay. About 100 m. before arriving at the very big roundabout at the crossing with the state road “Tiburtina Valeria” (S.S. 5), on the right you will see a small country church. Take the small road in front of it (“via Madonna degli Angeli”) and after 50 metres turn right along an olive avenue which will lead you to the farm. At the gate ring the bell “famiglia de Pompeis”. 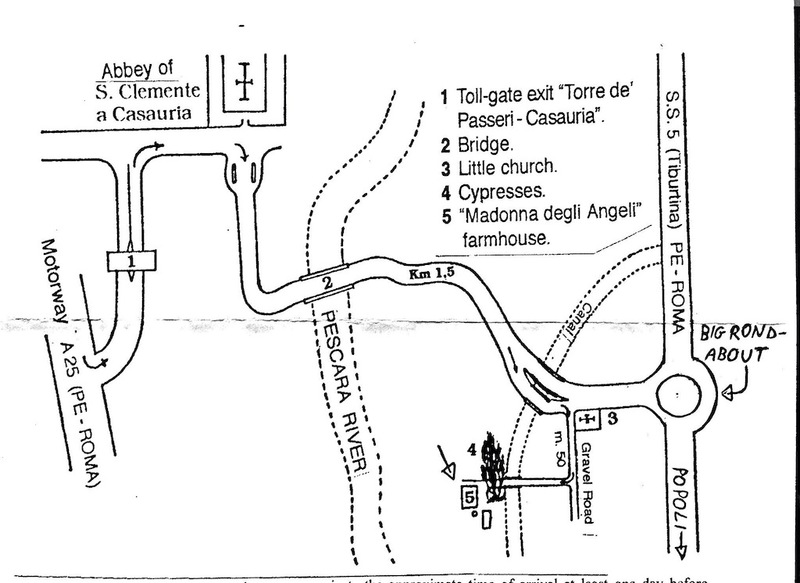 For the detailed map and additional information click on “How to reach the farm” inside our website (www.madonnadegliangeli.com). GPS: N 42° 13’ 40’’ E 13° 55’ 29’’ (“Tocco Da Casauria (PESCARA)” – “Strada Provinciale Piano D’orta Madonna degli Angeli, n° 13* – *just a few metres before number 25, on the right” – TomTom, TeleAtlas maps). 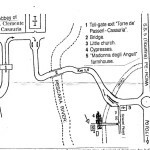 We are below the village (before it), so do not reach the village of Tocco Da Casauria, besides do not put in the GPS “Contrada Madonna Degli Angeli”, it will bring you to a wrong place! Country: Azienda Agricola “Madonna degli Angeli – de Pompeis” – Contrada Madonna degli Angeli, 13 – 65028 TOCCO DA CASAURIA (PESCARA) – Abruzzo – ITALY. Arrival: the property of the Farm Holiday house doesn’t live on site but is available to welcome the customers in the best way. Therefore it is necessary to call at least one day before and tell the time of arrival. Usually the facility is opened from 15,00 up to 20,30 p.m., unless otherwise provide (departure at 10,30 A.M.).